In the wake of a meat scandal in Asia, McDonald's will return to a full menu in some Chinese cities, but no word on whether the Big Mac is coming back. McDonald's is starting to come back in China, and perhaps not a moment too soon. The fast-food restaurant operator says customers in Beijing and Guangzhou can expect to see a full menu later this week, returning after a meat scandal dried up the supply of Big Macs and Chicken McNuggets. A McDonald's (MCD) spokeswoman says the company is still working on returning a full menu to other cities, including Shanghai. The news came as McDonald's announced in a regulatory filing that the food-quality issues in China are putting the company's worldwide sales for 2014 at risk. The SEC filing said affected markets in China and Japan make up 10% of consolidated revenue. The company said that among the actions it's taking to rebound in the region are menu and price changes, expansion, and making customers more confidence of its quality. The meat scandal started in July, when Chinese television showed workers at a Shanghai food plant handling expired and tainted meat with their bare hands. Workers at the Chinese subsidiary of OSI Group said the meat smelled bad and they could be seen processing meat that had fallen on the floor. The meat processor was shut down. 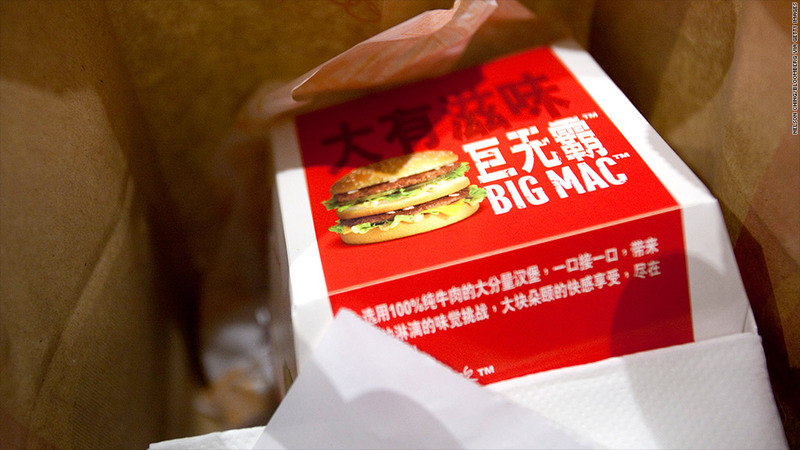 The lack of Big Macs in China, Hong Kong and Japan has taken a bite out of sales.